Lights... Camera... TEACH! : My New Life and an Editable First Day of School Sign! 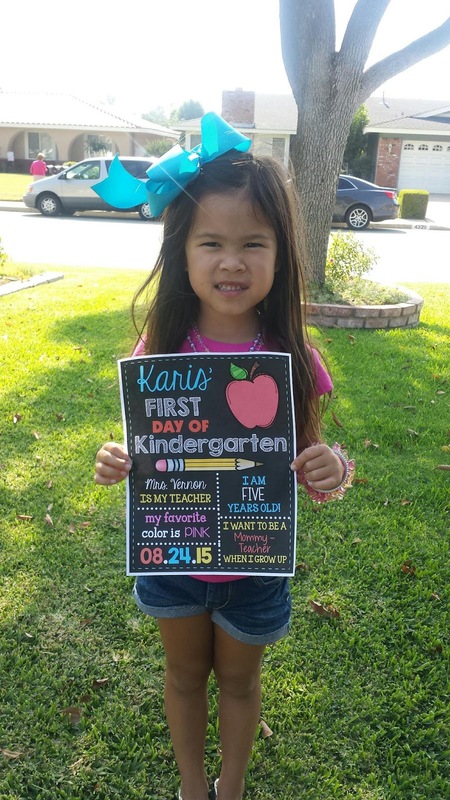 My New Life and an Editable First Day of School Sign! This next year I am starting a new chapter of my life. Ever since my kids reached the age where they began going to school, life kept getting busier and busier. Now that they are a bit older (ages 10,8,5) life is just CRAZY; sports, church, dinners on the run, taking kids to different practices, homework, projects, AHHHH!!!! I could not keep up! Last summer, my husband and I both agreed that we could not go on living like that. We did not like running on the hamster wheel. We wanted needed more family time. My husband works different hours than a normal "9 to 5" job so his day off are Fridays. My kids go to school on Fridays. See the problem? We had to make a change. We LOVE my husband's job so that wasn't changing. I LOVE teaching, so that wasn't changing either. We knew we wanted to kids to be home on Fridays so there was only one option. Change the way schooling looked. After 14 years of teaching in the classroom, I am taking a leave of absence to teach my kids...at home! I will be homeschooling my two boys (10,8) and my little one will be starting kinder at a school right up the street from our house. I felt that I needed to send her to kinder because seriously, I would not do kindergarten justice. I feel like I could not do all that learning through play and art projects well enough to give her a great experience. Kinder teachers out there... YOU.ARE.AMAZING!! Homeschool. Ahhhhh.....I can hear the comments now. Don't worry, my husband (and I at times) felt the same way. Here are some concerns that ran through our minds and our answers to them that calmed our hearts. Will your kids be "weird or awkward"? Well.. I'm weird and can be awkward and times....so yes. My kids will be "weird" and possibly awkward. :) In all seriousness though, I think that the parents play a big part in if the kids come out weird or awkward. Our goal is "NORMAL" and hopefully "AWESOME!" Ha! Will they have enough socialization? Oh friend, yes! Long gone are the days where there are no support for homeschooling mamas. We are doing a hybrid program where I drop them off a "school" once a week (Praise JESUS!) where I just signed them up for elective courses. We will also continue camping with friends, being involved in club and city sports, church, serving our community, and many more opportunities that we will now able to take advantage of. Will they be up to standard academically? Of course! My goal for my kids' lives have always been to first, love Jesus and love others, and to do things with excellence...whether on the field or off, doing chores, schoolwork, whatever! As I mentioned before, I just signed them up for classes that included STEM science, computers, Spanish, and Art and Drawing. I will be educating my kids classically (We are doing Classical Conversations).....which from what I hear, is pretty rigorous. This particular curriculum includes music theory, latin, history, and science (they will be dissecting this year). Because I am going through a charter school, my kids are also going to be taking the state test. How can you be with your kids ALL.DAY.LONG? I'm not sure. I'm sure that there will be days that I will be crying in the corner, rocking myself to self soothe. I'm sure the drop off program once a week will help. 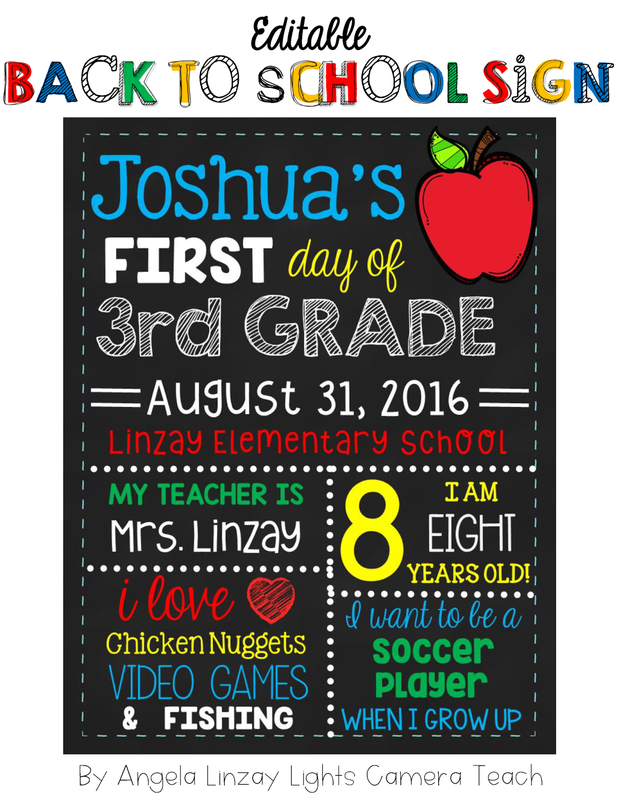 Since we are all getting ready for the beginning of the school year I have a sign that I created for my kids last year. I just updated them for myself and thought that you guys may want an EDITABLE copy for less than a latte! I think they turned out adorable!! If school already started for your kiddos, no worries. Just put this together, catch them before school one day, and make ask your kids to stand still so you can snap a quick shot.... AND no one will EVER know that it wasn't the first day of school. Shhhh.. I won't tell either. We mamas (and daddys) have to stick together here. After you purchase it, you will need to download some fonts if you want yours to look like mine. You can download them for free from Kevin and Amanda Fonts. Here is a list of fonts I used. WATCH OUT though! I can spend FOREVER downloading EVERY.SINGLE.FONT on Kevin and Amanda Fonts and not remember the project that I went there to do. UPDATE: Although Kevin and Amanda Fonts have adorable fonts, I've heard you cannot find these fonts there anymore...BUT they are on Teachers Pay Teachers. Search the font by name and download for FREE. This resource comes with this page so no need to write all this down right now. I've also included ALL the links for the fonts! You have different options as to how you want them printed. * If you want them on a regular 8.5x11 paper (picture below), just print it as you normally do. To get the poster size, all you have to do is change the setting on your printing options. I have a PC so these are directions for my computer. I'm thinking a Mac is not much different as far as the printing goes. 1. Go to your print page. Click Print Properties. 2.Go to the tab that says "Finishing". 3. When you get to the finishing tab, go to the drop down menu that says "Pages per sheet". I click 2x2. This will give you 4 sheets, which as you can see from the picture of my kids, is PLENTY big! You will have to put the sheets together. I print them on cardstock and attach them with packaging tape (scotch tape will also work) on the back. You can also laminate the pages FIRST then connect them with tape. 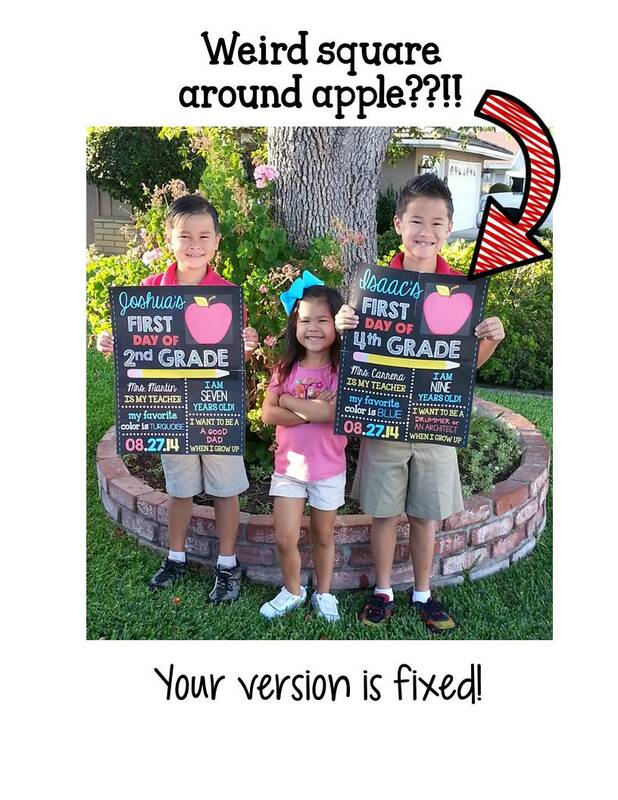 You can also get the bundle and compare First and Last Day pictures with the same sign. Hope you enjoy this resource! Have a great year Friends! This is really awesome! I'm having an issue finding the fonts you used on the linked website. Do you have a direct link to the fonts used by chance? Thanks! 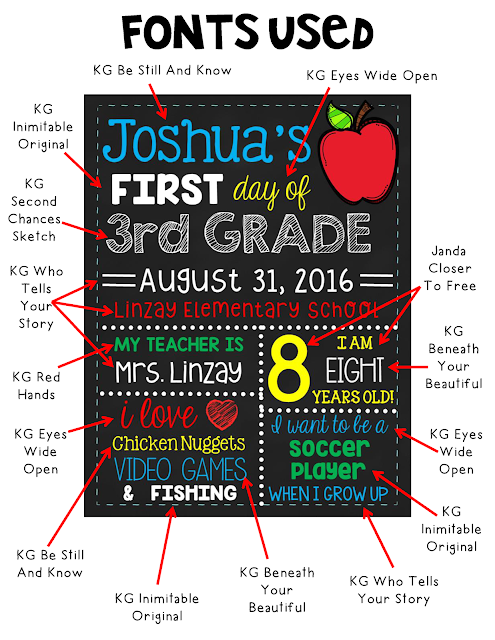 I actually found all the fonts on the TeachersPayTeachers.com web site. Just do a search for each of the fonts and you can download each one needed for the poster. Can the poster print on poster size paper instead of 4 pieces to make a large poster? Also, and this might be silly question, but do you print it on black poster paper? Or is it printed on white and then the black ink is printed on the paper? Yes. You can take it to Staples or any copy place to print them poster size. They come out nicely there. Also,I print on white cardstock (for durability). Good luck! this is what I need to do, how do I save my completed file so I can get it printed. I don't see how to save it as a picture to put on a flash drive to take to them. And thank you, my daughter loved this file. Please click "save as" and choose JPEG. Then you can put it on a flash drive and take it to get printed. Hope that helps! Love this freebie, thank you! I couldn't find the fonts needed on the website you mentioned but found them on teachers pay teachers. Quick question, after you download the font how do you get it on Microsoft power point? Kevin and Amanda Fonts have a search button that will help you locate all the fonts needed but I am happy that you found them on TpT. After you download the fonts, you may need to restart your computer. Once restarted, the fonts should be in your font selection drop down menu with all your other fonts so that when you are working on any document (word, PP, etc), it'll be an option for you. Thank you so much for this!! I do have a question though. I'm not computer savvy AT ALL so I need some direction as to what I do after I download the fonts lol Will they just show up in my font options after I install, or is there another step I'm missing? Quick question, I have downloaded all the fonts and for some reason the eyes wide open font does not seem to print the letters as tall as they are in your example. I've tried to mess with the sizes but it just makes them wider, not taller. Am I doing something wrong? Try making them capitals or changing the font size. Not sure why it's going wider. I've never had that issue before. We also homeschool and do not require a section for teacher's name. Is there a way I can edit this and replace with something else like "My Favorite Book Is"? Unfortunately, I will not know the name of my daughter's kindergarten teacher until we get to school. Is it possible to remove that field? I downloaded the file but in Adobe it's saying file is damaged or is not a supported file type. Any ideas? How do I change the color on Favorite for example favorite color is blue I want to change the color of favorite font to purple? There are two versions of that spelling for my Aussie friends. Once you download the product, you will see the other spelling of color and favorite. Is there a matching last day of school sign? I have the more detailed with memories sign I like with my school age child but really prefer this one for my pre schoolers. Is there a free download still available? When I click to download it is prompting for payment? where is the link to download? I used this last year and would love to use it again but cant find where to download!